Flexible installation, but safe: The Safefix Plus can be installed with the car's 3-point belt and support leg or alternatively with Isofix and support leg. The support leg provides extra stability for the car seat via the vehicle floor. And when the car seat is installed with the Isofix system, our patented Pivot Link Isofix system provides additional protection by minimising the forward movement of the child seat in the event of a frontal impact. This reduces the risk - especially of head and neck injuries - for your child. In case of an impact, our patented Pivot Link ISOFIX System directs the force first downward (1), into the vehicle seat, and then forward (2), more gently – greatly reducing the risk of head and neck injury for your child. The support leg provides extra stability for the car seat via the vehicle floor. 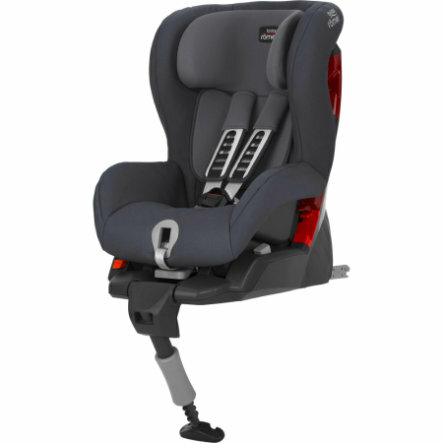 It minimises the tilting and rotational movement and reduces the forward movement forces exerted on your child in a crash situation, helping to protect them. For a secure installation, the support leg can be adjusted to suit the height that’s best for your car. The easy-to-read indicator shows you when the support leg is positioned firmly on your vehicle’s floor. Our soft, padded side wings act as a protective cocoon that helps absorb the force from a side impact, reducing the risk of injuries to your child. Our padded headrest and harness can easily be adjusted with one hand to suit your child’s height. Before you install the seat in your car, check to make sure the headrest is in the correct position – just above your child’s shoulders. The harness buckle stays in a forward position to make it easy to place your child in the seat for greater convenience. Things can get pretty messy on the road. Drinks can spill and children can get car sick. That’s why we designed a machine washable seat cover that can easily be taken off without removing the harness, so you can clean up quick and get on your way.